Image courtesy of Curvy Chic Closet, the Northwest’s Original Plus Size Clothing Event. As soon as we published this post about plus size consignment stores, our community asked us to start another list about of plus size consignment events! We thought that was a great idea! These events are so important to our community. For one, they help plus size people save money (you know our clothes cost more than straight size options!). And speaking of money, many wonderful people earn extra cash by selling gently worn items from their closet. But more importantly, these events help keep our fabulous fat fashions from being part of the 400 million pounds of clothing that end up in landfills each year. And to top it off, many of these shopping events are volunteer run fundraisers for important causes in our community! These organizers deserve a round of applause! When you make it to one (or more!) of these events, please let the organizers know how much I appreciate their work, OK? If you’ve been to an awesome plus size resale or consignment event we’ve missed, please add it to the form at the bottom of the page and we’ll keep the list continuously updated. Cupcakes and Muffintops is a plus-size clothing and bake sale for people of all genders in Oakland, California. The sale happens once per year in August, and benefits Big Moves and the Fat Friendly Funders. We pride ourselves on being a wonderland of affordable fatshion, delicious homemade treats, and inspiring positivity. We bring a Super Store to you with our semi-annual event for Curvy Women Size 14/XL-34. You can find an unmatched selection of the latest clothing, shoes and accessories for the discerning curvy shopper all in one convenient location. Shop for Plus Size name brand fashion at dynamite prices. 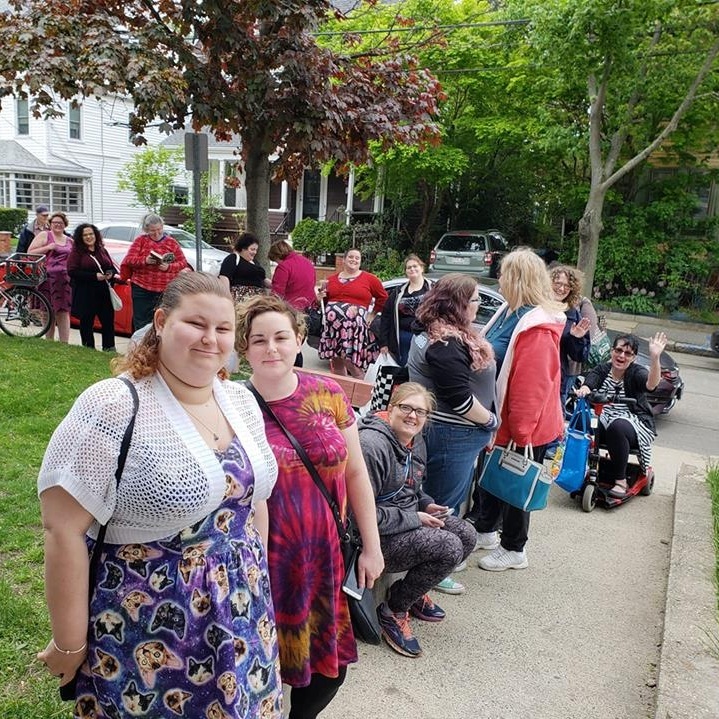 The Big Thrifty is an annual one-day bargain-hunting all-gender plus-size clothing event held at First Church, 89 College Ave., Davis Square, Somerville, MA, 11am-4pm, Sat., May 4th, 2019! All thrifted items $.50-$10.00! $5 door entry! XL+! Cash and Venmo accepted for shopping! Proceeds from The Big Thrifty 2019 benefit IMPACT Boston! Women's plus size fashion expo. Shopping vendors, fashion show, giveaways, complimentary beauty services, and more. Rebecca is the Founder of AllGo, the first review platform designed with fat people’s needs in mind. For years, Rebecca has heard plus-size people say, “As I got bigger, my world got smaller.” She felt the same way when she was just 18 and agonized about going to Six Flags with her high school class. She went anyway and she spent the day walking around the giant theme park, playing a version of Shame Roulette: Will she fit on this ride, or will she have to stay on the sidelines while her friends ride without her? A lifelong Oregonian, Rebecca was born and raised in Southern Oregon, lived in Salem while attending college at Willamette University and moved to Portland in 2011. Her Lhasa Apso Lucy is her pride and joy.